This article explains what a role is, and what each permission within a role allows a user to do. It also shows you how to edit role permissions and answers frequently asked questions. Every person in your GatherContent account has a role applied to them. 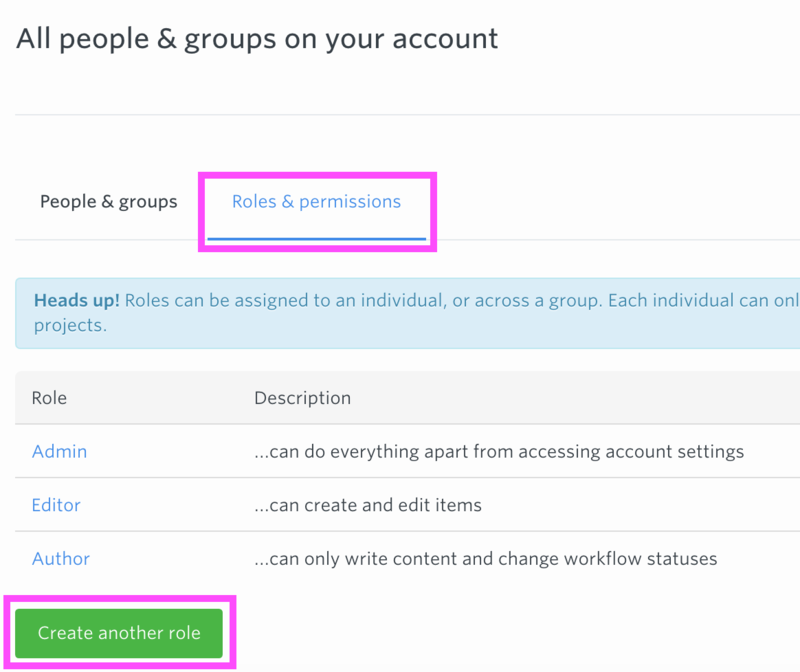 This role controls what users can do in your GatherContent account. Each GatherContent account comes with three default roles which can be easily customised. You can also create as many of your own roles as you need, and can tailor them to meet your needs using a range of permissions. Here you can see the roles you currently have in your account and a short description about each role. Click on each role to see what permissions that role has. 3. Edit the selected permissions and save the role to update it. Tip: Not sure what the permissions mean? Check the list here. 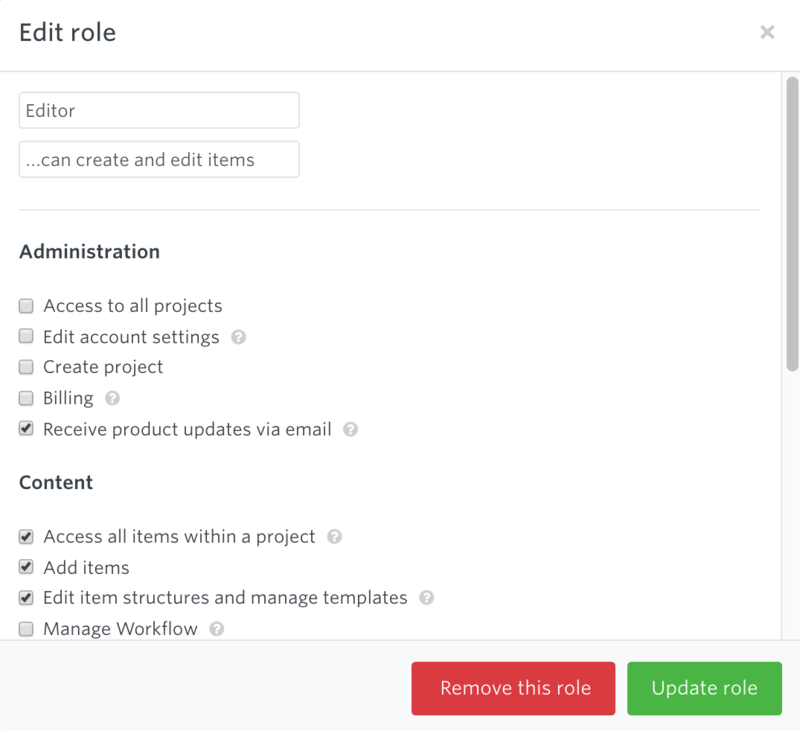 Scroll to the bottom of the Roles & Permissions tab, where you'll see a button labelled 'Create another role'. Click on this and select the permissions you want to apply to the role. 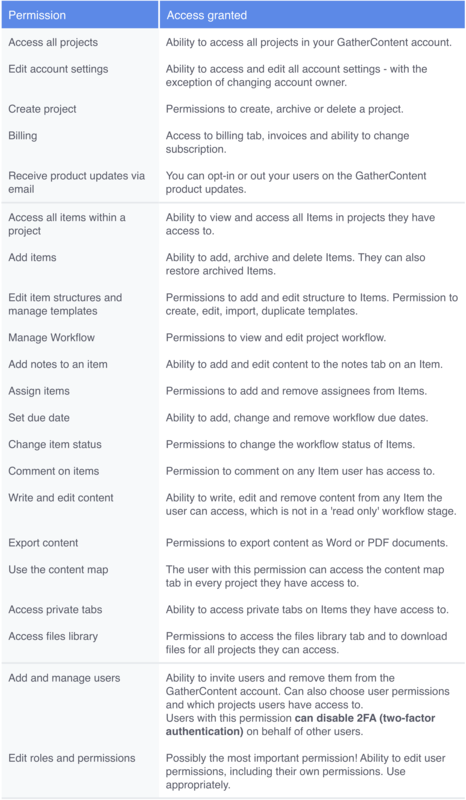 The table below provides a breakdown of all the permissions you can select for a role on GatherContent, and what they allow your user to do. - How do I set the permissions to get a 'read only' user? Create a role with no permissions selected. Remember to assign this user to the items they need access to. - How do I set the permissions so that a user can only access what they've been assigned to? Remember to assign this user to the items they need access to. Can admin users turn off 2FA (two-factor authentication) for other users in GatherContent? Any user with the permission 'Add and manage users' on their role can do this.